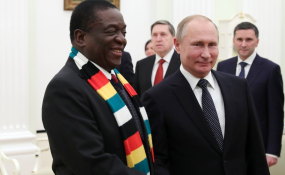 President Emmerson Mnangagwa and Russian president Vladimir Putin (file photo). Moscow — Zimbabwean President, Emmerson Mnangagwa, widely blamed for ongoing deadly protests in his country, looks to have ditched his mission to re-engage influential Western nations in his bid for economic revival. He (Mnangagwa) is instead reconsidering the 'Look East policy' initiated by predecessor, Robert Mugabe, who preferred partnerships with non-colonial countries after the West slapped sanctions on his government. Following a hastily held meeting with one of the world's superpowers, Russian president Vladimir Putin, here in Moscow last week, Mnangagwa is considering cementing ties with Brazil, Russia, India, China and South Africa (BRICS), the world's fastest growing economic bloc. Coinciding with protests in his country over a shocking increase in the price of fuel, Mnangagwa embarked on a tour of oil and gas rich nations of Azerbaijan, Belarus, Kazakhstan and Russia before attending the World Economic Forum in Davos, Switzerland later this week. Frantic efforts are reportedly being made behind scenes for Harare to urgently join the BRICS nations as relations he initially sought to mend with the West appear doomed. "There were talks in Russia about economic and political ties, but issues of regime change by the West in southern African region featured promptly," an impeccable Russian source told CAJ News in Moscow. Another source in Belarus said: "Always remain vigilant (Zimbabwe) because the West does not rest, especially in countries where mineral resources are plenty, particularly Zimbabwe, Democratic Republic of Congo (DRC), Angola... ... .in fact, the rest of Southern Africa." Indonesia, Malaysia, Mexico, Switzerland and Turkey are other countries keen on exploring partnerships with Zimbabwe. Earlier in a meeting with Putin, Mnangagwa said: "Zimbabwe is a sovereign state. We make decisions on the bases of national interests as well as the interests of those who are friendly to us." He noted a history with Russia, dating back to the liberation struggle against colonialism by Britain in the 1970s. "So there is no cause for us to depart from that stance," Mnangagwa said. Before heading to the World Economic Forum set for this week, Mnangagwa clinched some economic deals with Azerbaijan President, Ilham Aliyev, Belarus' Alexander Lukashenko and Kazakhstan's Nursultan Nazarbayev. Zimbabwe would export its products such as citrus fruits, coffee, tea, tobacco, gold, diamond, coal and recently discovered oil and gas when exploration eventually begins. "We are breaking new frontiers in search of economic co-operation in line with our policy of economic diplomacy," said Zimbabwe's foreign affairs secretary, James Manzou. Southern African Development Community (SADC) regional member states that saw the West play underhand in their recent elections include DRC, Madagasar and Zimbabwe. Other SADC countries holding elections this include Botswana (October), Malawi (May), Mozambique (October), Namibia (October) and South Africa (May) which are all ruled by liberation movements.